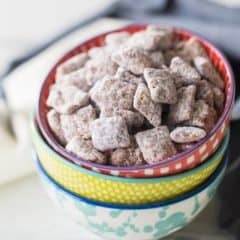 Whether you call it muddy buddies or puppy chow, this snack mix is FUN! A sweet, crunchy cereal treat made with peanut butter and chocolate. What do you think about a crunchy, sweet snack that’s got chocolate and peanut butter? That you can munch by the handful, and that both kids and grownups go crazy for? I’m talking about Muddy Buddies! Aka: puppy chow. No matter what you call them, one thing is for sure. Muddy Buddies are such a fun snack! 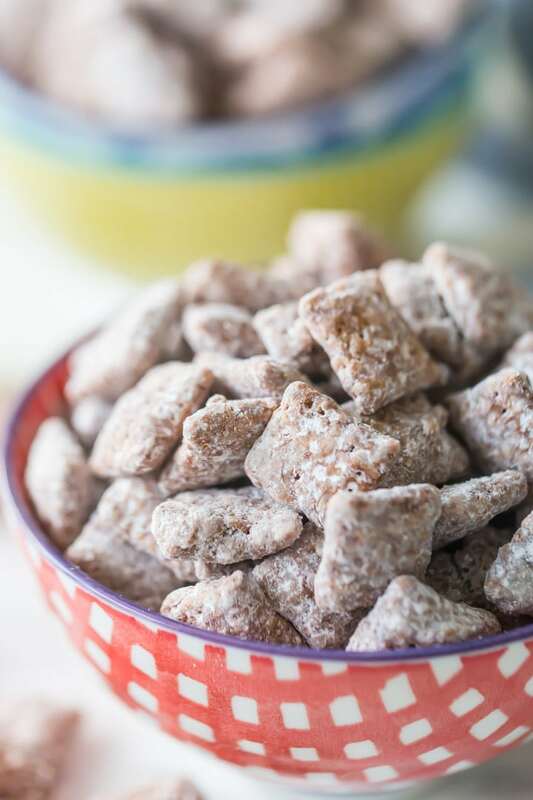 Muddy Buddies are a super-fun, super-easy snack mix that you are going to love. If you like peanut butter, chocolate, and crunchy cereal, then this is the recipe for you! I love quick and easy recipes like this, especially at this time of year. 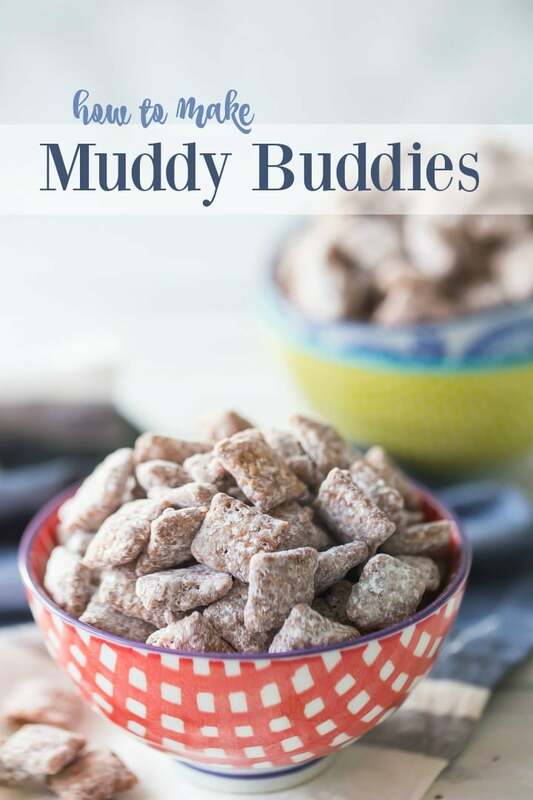 It’s so easy to make Muddy Buddies and such a fun thing to do with your kiddos. Just melt chocolate chips, peanut butter, butter, vanilla, and salt together in a big bowl. I like to do this in the microwave, but you could also set the bowl over a pot of simmering water, and do it double-boiler style. Stir the mixture together until smooth and then add your cereal. I used rice chex but you can use any kind of crunchy cereal squares you like. Wheat chex, corn chex, crispix, whatever! It all works. If you want to make gluten-free muddy buddies, just use gluten-free cereal. It’s that simple! Once your cereal squares are all covered with the chocolate peanut butter mixture, toss them in powdered sugar. 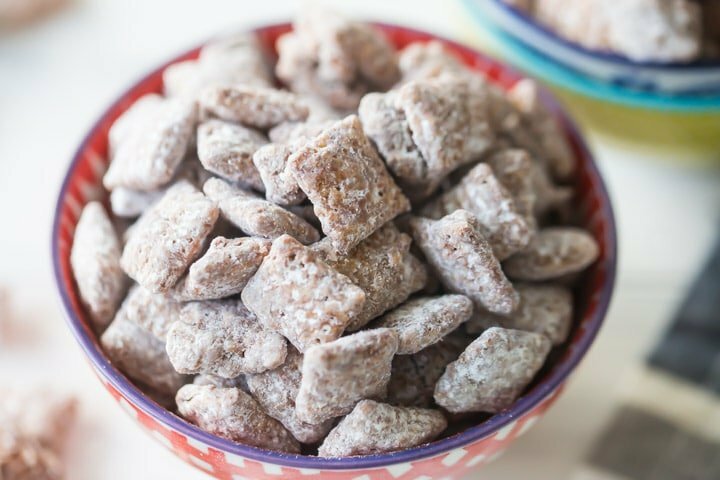 Besides just snacking on them by the handful, there are lots of great things you can do with muddy buddies. Pour into big mason jars, tie with ribbon, and give them away as holiday gifts! You can always buy colorful m&m’s in all sorts of seasonal colors and toss them in with the mix. And if you’re a fan of the sweet/salty flavor combo, try adding in some pretzels, peanuts, and/or popcorn. You could even get creative and try using white chocolate with sprinkles or crushed up Oreos. Yum! I also think it’s fun to bag up smaller portions of muddy buddies in cello bags and give them as party favors. This is a great idea for your kids’ class parties! And they make a great bake sale item, so keep this recipe in mind for when school starts and you are planning those fund-raisers! 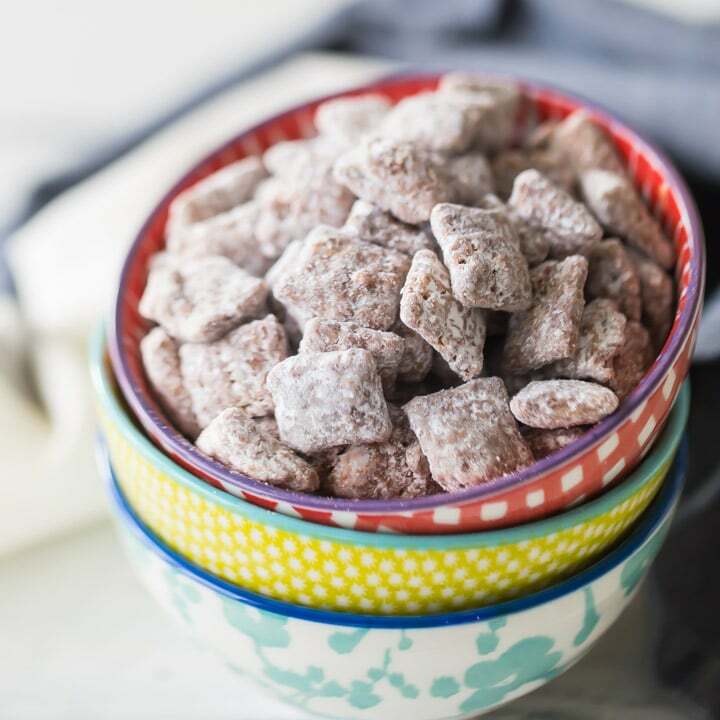 Muddy buddies are easy and fun to make and they’re such a delicious treat. I guarantee that if you mix up a batch, you won’t be able to stop snacking on them! Give them a try and let me know what you think! Place the chocolate chips, peanut butter, butter, vanilla, and salt in a large bowl and microwave* in 30-second increments, stirring. Stir the mixture together until smooth. Add the cereal and gently stir until all the squares are evenly coated. Add the powdered sugar and toss to coat. *If you don't have (or prefer not to use) a microwave, the mixture can be melted in a bowl set over a pot of simmering water. Such a good snack! Love this so much! I could snack on this deliciousness all day long! Yesssss-a total fave!!! And so nostalgic too!